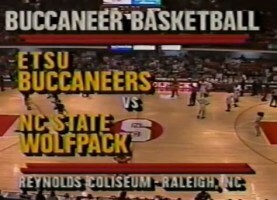 Complete video footage between ETSU and NC State in 1992. It’s not the most well known ETSU and NC State basketball game for buc fans but it was still another win for the Bucs over the Wolfpack. A year after the big win in Johnson City the ETSU men’s basketball team visited Raleigh for a second game inside Reynolds Coliseum. The Bucs started out slow but had a strong 2nd half to get the win over Les Robinson and the Wolfpack. This game marked the 3rd year in a row ETSU beat NC State in basketball. The two have not played since this game. See more ETSU basketball games in the video section.